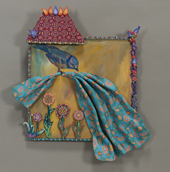 19"x16"x3" Polymer clay, colored pencil and acrylic on wood. Wall piece hangs with one nail. Inspiration: This piece is part of my Sketch Sculpture Series which all start with a sketch in colored pencil that I cut out and apply to a painted background. These are fun because I don't really have a plan- I just let the sketch lead me to the end which is always a surprise. When I imagined using this bird I thought I would have him on a branch but somehow I got the idea to make him holding a flower colored "Clothe" (which IS made out of clay) Then there was a space underneath- so flowers burst out. He looked like he needed a little protection so he got a little roof.